This week I’ll be experimenting with a lot of new recipe ideas. I hope I didn’t get your hopes up and make you think I was talking about scuba diving, rappelling, or wind surfing. I have done all of those things, but not recently. My idea of a good time is far less adventuresome these days. Breakfast is still oatmeal. No, I’m not tired of it yet; I change it up daily. It is the best way for me to get my omega 3s in early. If I don’t I usually don’t get them. 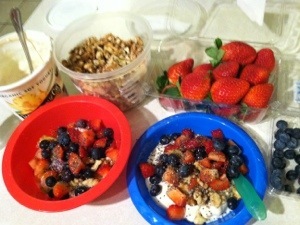 Plus my boys love oatmeal and cheer when I made it. Some mornings I may have toast with almond butter and apple slices. Lunch is usually leftovers but we are a little bare in that department right now. I’ll make extra for dinner this week so we acquire some. I also plan to have veggie stuffed pitas for me and almond butter sandwiches for my boys. Bean and grain bowls are easy to throw together too. Snack will be fruit, parfaits, or smoothies. I haven’t been eating near enough fruit lately so I want to focus on intentionally eating more. Dinner will be new recipes. 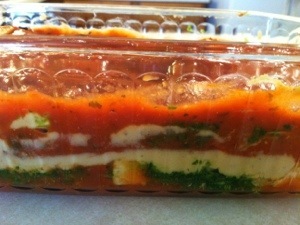 This weekend I created a delicious plant-based lasagna that I’ll post soon. Monday I made an incredible soup with brown rice, black beans, green chilis, and cilantro. My husband didn’t get any because he had a dinner to attend, I was supposed to go but I was sick and so was my babysitter. Double Whammy! I’ll be making a much larger pot of it again tomorrow and hopefully I’ll get some better pictures. I took a few on my phone and posted them to Facebook but it was too dark and I was too hungry to spend any more time on it. I plan to take a swing at a Baked Mac and No Cheese. I have a specific vision in mind for this so I’m really hoping it turns out well. I will probably cook one other big meal but I don’t know what it is yet. I have some black-eyed peas soaking so it may involve them but I’ll also make more beans this week. I did some experimenting last week too. 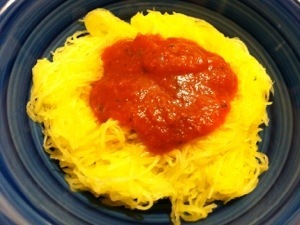 I made spaghetti squash for the first time. It was ok but I had forgotten why I stopped making spaghetti. It is too messy for a two-year old! I’ll stick to small noodles for a while. I also made a chocolate swirl banana bread that was pretty good but I was going for more of a coffee cake. I plan to tweak it more before I share it with the world. Lastly, I made my first tofu scramble. I know, I don’t use tofu. You’re right I don’t but I do like to try new things and I had some left from making Somer’s Ranch Dressing. My boys loved the scramble. I didn’t eat it because I had just had dental work and opted for Potato Soup. I don’t think the scramble will make it into our regular rotation but it may make an appearance every once in a while. So you like to try new things, either in the kitchen or in everyday life? I love trying new things!! In all aspects of my life. LOVEE IT! When did you make this transition? Do you find it to be more expensive? My husband and I just watched Forks Over Knives and are seriously considering changing our diets to plant-based whole foods. We currently eat pretty clean but with a lot of dairy and meat. My husband is a hunter and Venison is one of our favs. I really don’t see how eating Venison can be all that bad. Its very lean and the deer eat plant based food. Hi Krystal! We began our transition in October of 2011. We spend less on groceries now, before we bought lots of meat and dairy. In the beginning we simply cut back on meat and ate it once or twice a week. It helped take some of the pressure off of switching. Speaking of Forks Over Knives, they describe how eating 10% or more calories from animal products would turn cancer on and off. If you eat venison (in small portions) a few times a week you would probably be below that 10%. Dr. Fuhrman, also on Forks Over Knives, says to use meat as a condiment or for flavoring. Eating plant-based is completely doable! Feel free to email me any questions! Am I missing the link to the vegetable lasagna?? 🙂 I’m interested in trying it! I haven’t posted it yet. I’ll probabaly post it Friday.